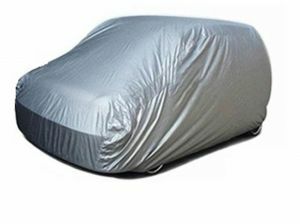 Spidy Moto car body cover when you spend lakhs of rupees on buying your dream machine then why compromise treating it in a best way so that it remains with you for years to come . In country like india with so harsh weather conditions so we present wide range of excellent quality all weather car body covers with elegant design and superb finishing which matches your car perfectly.Go for Spidy Moto imported best quality range of car body covers. Features: elegant steel grey color with mirror pockets all weather 100% water proof heat resistant 100% uv resistant (some ultra violet rays cause paint fading) scratch resistant buckle clip feature (means strong winds will not take away protection of your car no matter how bad the weather is) package contents:1. High quality premium body cover.